Always dreamed of a high-grade professional compass while trekking the mountains or just freely-roaming around the jungles, but found many way too expensive? Well, Android users, it is time to rejoice as Compass PRO hits the Android shore for free. The compass is a high-quality product and works like a charm. Created by Mobile Essentials, this developer has quite a few utility apps in their kitty and all of them work quite well, but it is the Compass PRO that is a definite must-have app for the globetrotter at heart. The best part about having Compas PRO installed on your Droid is that users need no extra device to help them keep a track of the path they are going on. It is in the pocket, accessible anytime and anywhere. Compass PRO shows very accurate directions of North, South, East and West. There might be a slight degree of intolerance of 0.5%, but that is acceptable, right? The app very effectively shows degrees in the ‘side window’ and the user-interface is very slick to say the least. Unlike other Compass apps, Compass PRO features a no-nonsense approach and avoids cluttering the screen with unnecessary information. 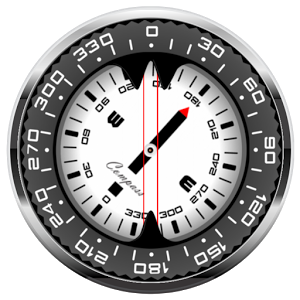 Moreover, the rotating bezel within the app with the audio effects provides a great response to directions and the transition is very smooth. Overall, the app is great and does its work in just the right way. Developers get a personal thumbs-up due to the fluidity that has been so well integrated within the app, making it a uncluttered way to keep track of locations, rather than barging the app with clutter and making it unproductive. The developer page on the Android Market provides a very detailed information to use the app in the most appropriate way.